You want your brand to be seen, right? You spend time and money developing the perfect logo and brand color scheme, so why not make it visible when someone shares your page on social sites like Facebook, Digg, and Technorati (for blogs)? Here’s a quick tip on how to increase your visibility by adding a thumbnail image to your website, which will automatically be displayed when someone shares your site or a link to your site elsewhere on the web. Of course, change http://your-domain.com/your-logo.png to the URL of your own logo. Credit to Alex Moss at Yoast for the original function. Be sure that your logo file is at least 200px x 200px. Facebook changes their preferred image dimensions all the time, but this is the latest spec. Check your work by visiting this page. 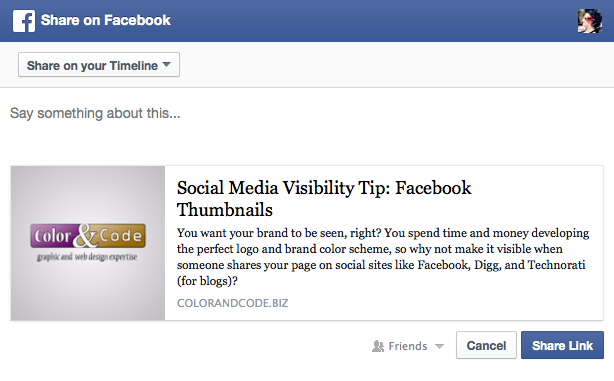 If all is done correctly you should see your logo thumbnail displayed. If not, this page will tell you what is wrong. A final check is to copy & paste a link to your page within the status bar of facebook itself, and see what comes up in the preview. There are many more tags and optimizations you can do to your site, this is only the beginning. Read more about the Open Graph protocol, which is used by facebook and others to classify content: https://developers.facebook.com/docs/opengraph/. and actually good stuff in favor of visitors.